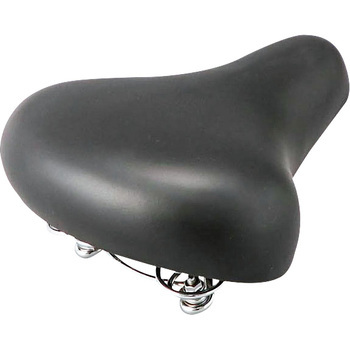 Replace the bicycle saddle because it has deteriorated. It was surprisingly cheap, so I thought it was fine, but it was fine! Monotarou logo is unexpectedly cute. I like it. This review is about item#57052204. As it looks good, there was a bargain feeling. It is a price that you hate to buy parts at home center. This review is about item#57052195. For repair of electric assist bicycle. The brown color of the saddle came to be attached to the pants in about a year whether the surface was degraded by ultraviolet light. Although Bridgestone genuine has been torn by aged deterioration, there was no such thing that a color is attached. It was cheap and I didn't feel comfortable, but I'm sorry. This review is about item#57052213. The price was cheap, and it was firmer than I thought. There is no complaint if you can choose the rigidity of the seat. Replacement of an old saddle for a school bicycle. The old bike has come back. It is worth more than the price. I changed it because my mama's saddle was so tired. I am firm but cheap. I think cheap and good quality. Ameno not? I'm glad I lost the logo. The cushions were just right and the ride was better, the price was also affordable. I am satisfied because it is cheap and usable without problems. I think firmness is normal. We purchased for two sets with different colors. A new article feels good at the price of buying a saddle cover. The ride is not bad either. If the sheet breaks due to deterioration, I will do this again. I bought it because the bicycle saddle I bought several years ago was torn up. The softness of the sheet is moderate and the color is natural and familiar. May the taste be divided because the monotarou logo is included in the white silk print on the right side of the saddle in one point? It is soft and has a good reputation. I do not know the durability, but I think it is a cheap and good product. Durability · weather resistance is not yet known, but seems to be better for the low price. I was concerned that the price was low, but as shown in the photo, I was relieved that it was surprisingly good and good. Installation was also easy. Plating is also a clean and good saddle. It is the second purchase in repeat. I live in an area with strong UV rays, so the sheet on the surface will deteriorate soon, but with this saddle, it is hard to sit on, but I think the heel is good.